Millipede ("thousand legs") is the common name for any member of the arthropod class Diplopoda (previously also known as Chilognatha), comprising species with elongated, cylindrical bodies with many segments, and with two pairs of jointed appendages on each body segment except the first few and the last. Unlike the similar and closely related centipedes (Class Chilopoda), which are fast-moving and predatory, millipedes are detritivores, slow, and nonvenomous. Most millipedes eat decaying leaves and other dead plant matter. In fulfilling their own need for nourishment, they simultaneously provide a larger ecological function by breaking plant materials into smaller pieces that aids the recycling of nutrients by bacteria and fungi. However, millipedes can also harm certain agricultural crops, be a minor garden pest, and even experience population explosions. This class contains around 10,000 species. As arthropods, millipedes have a segmented body and paired, jointed appendages on most segments. Like the centipedes, which they resemble, millipedes are highly segmented (20 to 100 body segments). However, millipedes have a cylindrical body with two pairs of legs on most segments, except for the first segment behind the head, which does not have any appendages at all, and the next few, which only have one pair of legs. Centipedes are dorso-ventrally flattened and have one pair of legs on all segments excepting the hindmost segment. The millipede segments that have two pairs of legs are a result of two single segments fused together as one. The millipede's most obvious feature is its large number of legs. In fact, its name is a compound word formed from the Latin roots milli ("thousand") and ped ("foot"). Despite their name, these creatures do not have a thousand legs, although the rare species Illacme plenipes have up to 750 (BBC 2006). However, common species have between 80 and 400 legs. Having very many short legs makes millipedes rather slow, but they are powerful burrowers. With their legs and body length moving in a wavelike pattern, they easily force their way underground head first. They also seem to have some engineering ability, reinforcing the tunnel by rearranging the particles around it. The head contains a pair of sensory organs known as the Tömösváry organs. These are found just posterior and lateral to the antennae, and are shaped as small and oval rings at the base of the antennae. They are probably used to measure the humidity in the surroundings, and they may have some chemoreceptory abilities too. Millipedes eat dead and decaying plant matter (and the associated fungi and bacteria), moisturizing the food with secretions and then scraping it in with the jaws. Some millipede species may be amphibious. The Giant African Millipede is the largest species of millipede. This class of arthropods is thought to be among the first animals to colonize land during the Silurian geologic period. These early forms probably ate mosses and primitive vascular plants. Indeed, the very oldest known land animal, Pneumodesmus newmani, was a centimeter-long millipede. This was caused by an American millipede. The child put on her shoe and crushed the millipede which had crawled in her shoe the night before. Due to their lack of speed and their inability to bite or sting, millipedes' primary defense mechanism is to curl into a tight coil—protecting their delicate legs inside an armored body exterior. Many species also emit poisonous liquid secretions or hydrogen cyanide gas through microscopic pores along the sides of their bodies as a secondary defense (Blum and Woodring 1962, Mason et al. 1994, Kuwahara et al. 2002). Some of these substances are caustic and can burn the exoskeleton of ants and other insect predators, and the skin and eyes of larger predators. Lemurs have been observed intentionally irritating millipedes in order to rub the chemicals on themselves, apparently to repel insect pests, and possibly to produce a psychoactive effect. As far as humans are concerned, this chemical brew is fairly harmless, usually causing only minor effects on the skin. The main effect is normally discoloration, but other effects may also include pain, itching, local erythema, edema, blisters, eczema, and occasionally cracked skin (Mason et al. 1994, Shpall and Frieden 1991, Radford 1975, 1976). Eye exposures to these secretions causes general eye irritation and potentially more severe effects such as conjunctivitis and keratitis (Hudson and Parsons 1987). First aid consists of flushing the area thoroughly with water, further treatment is aimed at relieving the local effects. In addition to their important ecological role in nutrient flux, millipedes are key to food chains, serving as food for such predators as beetles, shrews, hedgehogs, rodents, frogs, lizards, turtles, and birds (Ramel 2007). Many millipedes are quite docile and may safely be kept as pets and handled without risk of injury. The Giant African Millipede (Archispirostreptus gigas) is a common pet millipede. Sometimes you can buy very similar millipedes under the name Lophostreptus rutilans but in most cases it is just Archispirostreptus gigas. With the proper caging and feeding, pet millipedes can live up to about seven years and grow to be as long as 15 inches. Occasionally, millipedes can be pests. Some undergo population explosions, with Parafontaria laminata in Japan sometimes so numerous that trains lose their traction, and one swarm in West Virginia in 1949 estimated to have been made up of 65 million individuals (Ramel 2007). In Europe, millipedes damage sugar beet crops, and in Africa some species damage cotton and groundnuts (Ramel 2007). 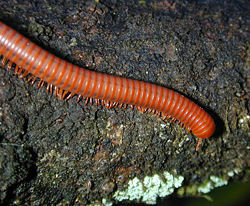 In the United States, Oxidus gracilis is the main culprit, and the millipede Orthomorpha gracilis was once a pest in gold mines in South Africa due to consuming the wooden pit-props (Ramel 2007). Millipedes can be a minor garden pest, especially in greenhouses where they can cause severe damage to emergent seedlings. Signs of millipede damage include the stripping of the outer layers of a young plant stem and irregular damage to leaves and plant apices. BBC. 2006. Most leggy millipede rediscovered. BBC News. Retrieved April 1, 2007. Blum, M. S., and J. P. Woodring. 1962. Secretion of benzaldehyde and hydrogen cyanide by the millipede Pachydesmus crassicutis. Science 138: 513. Hudson, B., and G. Parsons. 1987. Giant millipede 'burns' and the eye. Trans R Soc Trop Med Hyg 91(2): 183-185. Kuwahara, Y., H. Omura, and T. Tanabe. 2002. 2-Nitroethenylbenzenes as natural products in millipede defense secretions. Naturwissenschaften 89(7): 308-10. Mason, G., H. Thompson, P. Fergin, and R. Anderson. 1994. The burning millipede. Med J Aust 160: 718-726. Radford, A. 1975. Millipede burns in man. Trop Geogr Med 27(3): 279-287. Radford, A. 1976. Giant millipede burns in Papua New Guinea. P N G Med J 18(3): 138-141. Ramel, G. 2007. The Diplopoda (millipedes). Earthlife.net. Retrieved April 1, 2007. Shpall, S., and I. Frieden. 1991. Mahogany discoloration of the skin due to the defensive secretion of a millipede. Pediatr Dermatol 8(1): 25-27. All links retrieved October 8, 2018. Blue Polydesmid millipede - Picture taken in Veracruz, Mexico. This page was last modified on 8 October 2018, at 18:34.